Washoe County, Nevada encompasses 41 zip codes, however many of these zip codes are for P.O. boxes only and contain no homes. The analysis below applies to only those zip codes containing homes. Data in the charts and tables below covers both site/stick built and condo/townhouse sales in Washoe County, Nev. for the 2018 year. Data excludes manufactured/modular homes. Additionally, due to very low number of total annual sales in the following zip codes: 89442 (Wadsworth — 4 sales); 89402 (Crystal Bay — 5 sales); 89439 (Verdi — 19 sales); and 89510 (Pyramid Lake – 27 sales), these zip codes have been excluded from the rankings charted below. To see all the zip codes within Washoe County click here. For an interactive zip code boundary map for Washoe County click here. Use the + and – buttons to zoom in and out, respectively, on the map. How did home sales in 2018 compare across Washoe County’s zip codes? Let’s take a look. 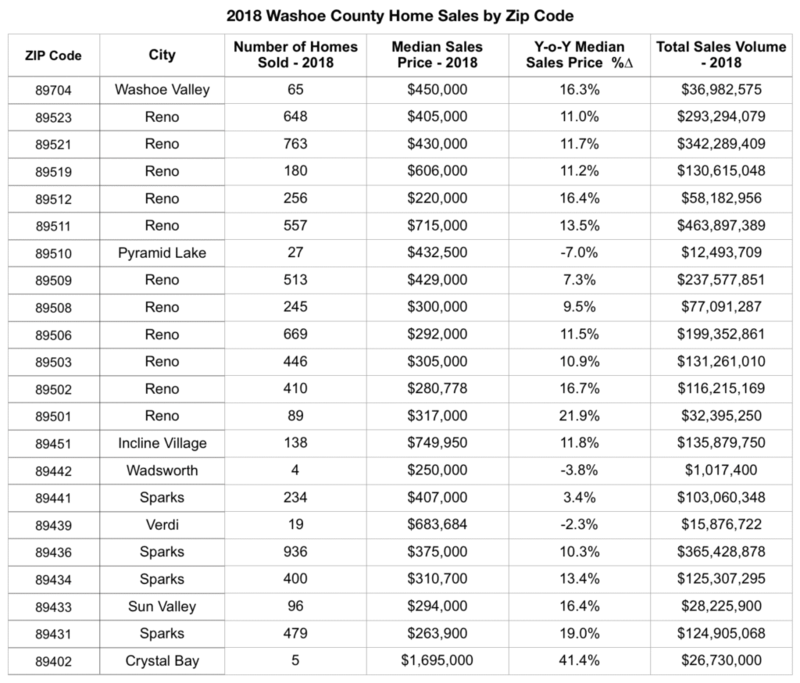 Of the nearly 7,200 houses and condos sold throughout Washoe County in 2018, five zip codes accounted for half of the units sold. The table below shows the top zip codes in terms of unit sales. 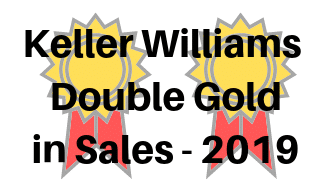 89436 (Wingfield Springs) in Sparks, Nevada took the top spot (as it also did the previous year) with 936 home sales in 2018. The table below shows the zip codes with the lowest median sales price in 2018. With a median sales price of $220,000, zip code 89512 (Reno – North) exhibited the lowest median sales price in the county. For the year, home prices in Washoe County increased 10.9 percent overall year-over-year. However, this increase was not uniform across all areas. The table below shows the top zip codes in terms of year-over-year median sales price increase. 89501 (Reno – Downtown Core) took the top spot with a nearly 22 percent year-over-year sales price increase — twice the 2018 median sales price for the county as a whole. The table below shows the data for all Washoe County Zip Codes. Click on the table to enlarge. Have additional questions regarding home sales by Washoe County Zip Codes? Post your question in the comment below. And thank you for reading! Note: The home price reported above covers the zip codes of Washoe County, Nevada. Residential data includes Site/Stick Built and Condo/Townhouse properties only. Data excludes Manufactured/Modular and Shared Ownership properties. Data courtesy of the Northern Nevada Regional MLS – January 10, 2018. This information is deemed reliable, but not guaranteed. This entry was posted in Agent Insights, Market Trends and tagged median sales price by zip code, price by zip code, sales by zip code, Washoe County, zip code. Bookmark the permalink.